This is definitely the best coconut rice EVER! Creamy, smooth and light! 1 Heat broth, coconut milk and ginger to boiling in saucepan over medium-high heat. 3 Heat to boiling, reduce heat. 4 Cover and simmer 15 minutes or until rice is tender and liquid is absorbed. 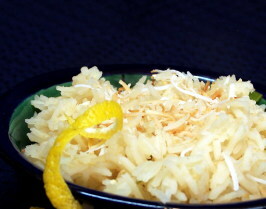 5 Add lemon rind and green onions; fluff rice lemon rind and onions lightly with fork to mix. 6 Garnish with coconut and lemon slices.